The holiday season is in full force for 2015 – pun intended, with the new Star Wars movie coming out soon. As I drove back home last night, I thought about what the season means to me. 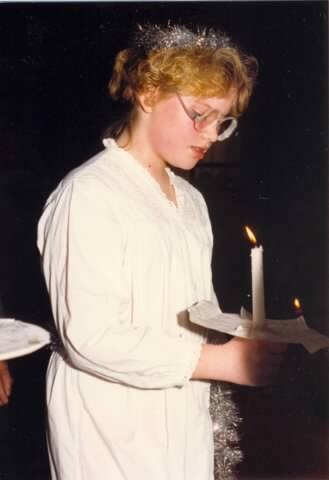 For me, St. Lucia represents the purity and innocence of life, which is recaptured each year when we celebrate. As we sing Silent Night, first in Swedish, then in English, hope and faith in humanity is restored. We can face the trials of our lives for another day. Christmas Eve church service ends similarly with Silent Night. Everyone lights their candles, one by one. The heat from the small fires always warms my heart and mind. The energy in the sanctuary is almost palpable as we welcome the boy child of God into our lives. I so believe in Magic. Experiencing these two particular celebrations is evidence to me that Magic is real. People come together to enjoy good music and wonderful company. Food for my soul. What feeds your soul during the holidays? ← Book Four of my first series of haikus on Amazon now!